Voted San Francisco's Most Popular Hostel for 2017 & 2018, HI San Francisco Downtown offers a first-rate location and top-notch amenities at reasonable prices! 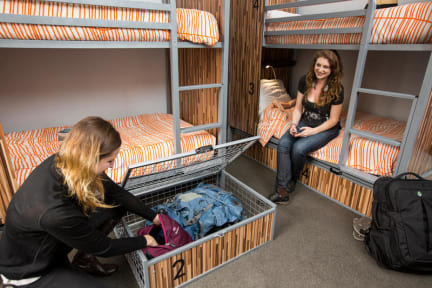 This safe and secure hostel is at the center of everything: cable cars, Chinatown, Museum Row, Union Square, and plenty of world-class shopping, restaurants, theatres, and bars. On site, we’ve got plenty of perks to keep travelers happy, including fast free Wi-Fi, free breakfast, a fully equipped guest kitchen, and lots of free or cheap activities and tours. Come see why the San Francisco Bay Guardian calls us “a budget traveler’s dream in the land of pricey downtown hotels”! Housed in a charmingly renovated 1909 hotel, HI SF Downtown offers a wide assortment of room types, many with private bathrooms. Our dorms can sleep 4-8 people, and our private rooms come with either one double bed, two twin beds, or, in the case of our '3-person private' room, one double bed with a twin bunk up top. While you are out exploring the city during the day, our housekeeping staff makes the daily rounds in order to have the place squeaky clean and comfy when you return each evening. Tempting as it may be to stay at the hostel all day, we want to help you get out and explore! We offer lots of free or cheap organized activities including pub crawls, walking tours of the Mission District and Chinatown, and bike trips across the Golden Gate Bridge. Feel like checking out the city on your own? We’re within walking distance of the Yerba Buena Gardens, the Metreon entertainment complex, Union Square shopping, Chinatown, and the cable cars that will take you to North Beach and Fisherman’s Wharf. We’re also just 1 block from major MUNI bus lines, and 3 blocks from the BART trains that will get you to the San Francisco and Oakland airports on the cheap. I loved stay at this hostel, so close to a lot of places and the staff really helped me! I have nothing to complain.